At Bridges Septic Sewer & Drain, we make it our mission to provide the highest quality work at the best price. We offer expert septic tank pumping, cleaning, installation, and repair services for commercial and residential settings. We stand by all that we offer and guarantee your satisfaction. 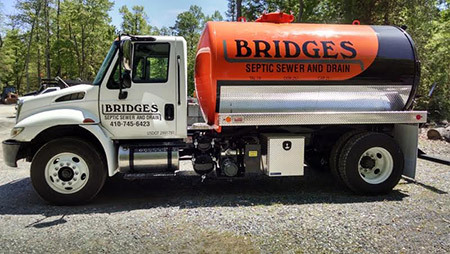 Established in 2011, Bridges Septic Sewer & Drain offers septic cleaning and septic pumping in St. Michaels, MD and the surrounding areas of Talbot County, Caroline County, & Dorchester County. Our locally-owned and -operated company provides exceptional commercial and residential cleaning, pumping and repair services. Fully licensed, bonded and insured, our professionals give you peace of mind about your septic system. Our crews arrive on schedule and stay focused on your satisfaction. We take pride in offering affordable and reliable services, every time. We guarantee that you will be completely satisfied by the time our experienced professionals are done. Our business is locally-owned and -operated, established in 2011. We are fully licensed, bonded and insured to ensure our continued reputability. We provide pumping, cleaning and repairs for septic systems in commercial and residential settings. Our experts are Maryland Department of Environment and Sand Mound Septic Systems Certified. We offer free estimates on all of our septic services and can help you assess your need for service. When you want your septic system treated right, the first time, contact the experts at Bridges Septic Sewer & Drain.